Went out to the yard today to look into the statues of my colonies. Ten out of 22 colonies so far are still alive. The hive to the right in the picture is my oldest colony presently going through its third winter. If it continuers to live into spring, It has a future as a breeder for AHB queen daughters for making up nuc splits, and such. I have not enabled this hive to winter except for I did not enter its sanctuary when taking honey this last fall, I have not disturbed its sanctuary at all. I plan on getting into this colony later when I begin to see pollen coming in. At that time I will take a quick look for a first spring check for health and set the hive up for the build up by cleaning dead bees out, changing out the bottom board, and checking to clean dead bees off unused comb. I will not feed this one because I want to make sure it can make it on its own with it’s own stores that are natural, (no artificials) that was brought into the hive last season by the bees. The current believe in beekeeping and normally taught in bee classes here in Alaska is that bees will winter better on stores made up of sugar syrup fed to them, after taking honey stores late summer. Honey stores are considered inferior as winter stores because it is taught that honey has a lot of ash (mineral particulates) that bees must evacuate during long winters. Sometimes there is no opportunity for them to have a cleansing flight until March and may not be able to hold their feces for long enough. If a strain is to survive Alaska it must have the ability to hold their guts for long periods of time, and do it clean, with minimal soiling inside and outside the hive. It is thought that stores derived from sugar syrup is easier on the bees because it has no ash for them to have to evacuate in the winter, and that this will not contribute to a dysentery condition. A dysentery condition is easy to observe from the outside of a hive by a really thick coating of feces around the entrance and on the hive radiating from the entrance. When you enter the hive the feces is also coating the tops and sides of the frames. But really you can call it by the conditions before entering the hive by the feces at the entrance itself. This hive seems to defy that logic by wintering on honey, not sugar syrup, and keeping itself clean of dysentery. Despite the fact it is wintering on stores currently considered bad by those saying that sugar syrup is best because it is cleaner to winter on, this colony is clean, and quite, except for the constant hum from inside. All my live colonies show no ill affects of wintering on honey instead of sugar syrup either, showing little to no staining at the entrance, all seems good so far. am hoping the picture will come through so you can see how clean the hive looks so far from the outside, very clean. The entrance that is being used is the front seam between the two deep hive bodies, the bees can easily use this entrance. I put my iPhones recorder mic up to their seam entrance to hear the bees inside, the iPhones recorder can hear better than I can. I wanted to hear them with as little disturbance as possible, I tried to be quite and did not knock on the hive as is usually how beekeepers do it. If a hive is alive during the winter they will always have a low hum in the hive while they shiver and buzz their wing muscles to keep warm. So they are always a humming, no need for knocking on the hive and riling them up. The iPhone mic picked up the hum easy as I listened to the recording. It was good to hear all the buzzing, the recording picked up the hum lots better than my ears could have, but I also put my bare ear up to the entrance and could hear the faint hum just a lower volume compared to the recording. So far this hive is fitting the example of brother Adam’s description of good wintering traits for a hive that winters in the north with long winters, In his book “Breeding the Honeybee” Sub-Title “hardiness and Ability to winter”. own strain, in identical conditions, will remain completely inactive. It almost sounds like brother Adam was describing traits needed for wintering in Alaska. 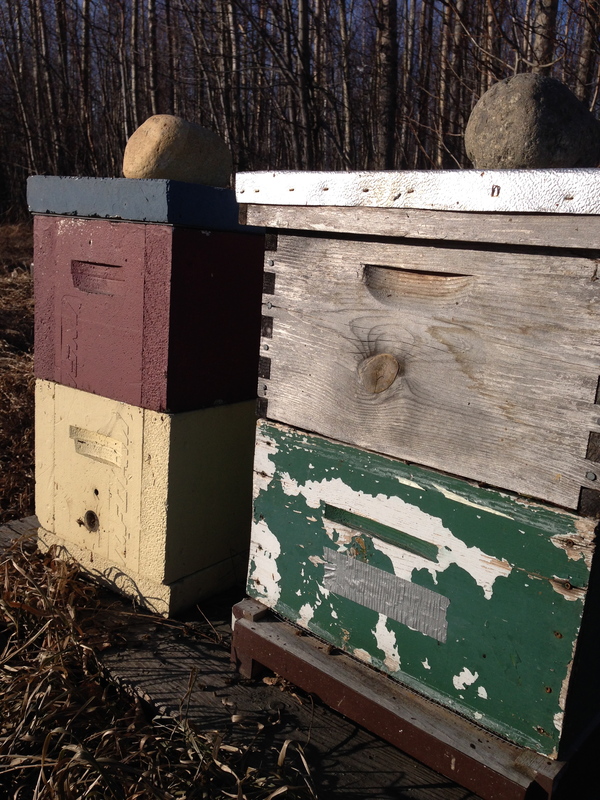 To me it is particular traits genetically that will improve wintering bees in Alaska. I will try to keep everyone updated on the progress of the nearly four year old colony that appears so far to be doing fine. The picture below was taken yesterday March 03, 2014. I have just finished having a discussion on the HiTunnel group down here in Homer about overwintering. I would like to understand what you are doing so I can prepare to duplicate it as closely as possible, here on Diamond Ridge above Homer. Still in shock over loosing 5 hives years back. I want to have the best setup possible before I attempt it again. You may not want to duplicate what I do, my focus is in finding genetics, you on the other hand want to give every colony you have the best chance at surviving winter. Let’s say the first year goes good for a colony, and the broodnest was able to build up two deeps, or better three deep boxes, or five/six Illinois supers (shallow or medium). You might not get honey the first year, but with honey for wintering they will have the best chances of wintering the duration of our winter, and be healthy enough to have vigor to rapidly expand the nest for summer. You can help keep them dry by providing a roof over the hives with open air. Some bring hives in to a shed that is not air tight, leave the door ajar if need, bees can find their way out if close to an open way outside. Others make a climate controlled room to winter in. If you can get your bees in BEE MAX Polystyrene Bee Hive equipment I think it would be best. BEE MAX hives do not breath like wood does so more attention to ventilation is required. It has a screened bottom, but needs an upper entrance. Try to set your hive on a relatively dry spot. I have felt the shock in the past and still do when I see a dead-out. Your location receives a lot of snow that seems to linger, Correct? Your bees may be better off for spring startup, and wintering, to be down hill from the ridge, lower in altitude, where it rains more than it snows. Any way you need antiquate ventilation to make up for high humidity in the air. You may even need to have an absorbent to collect moisture during winter starting in fall. If you still have the comb drawn from the last your attempt you can use them to help the next batch to be further ahead in the spring not having to draw comb from scratch. Can you tell us what you did to prepare them in the fall for wintering, and try to describe the sort of winter weather they had? I am trying to learn what it may have been that did the bees in, do you know what may have been the trouble? I think your on akbeekeepers yahoo group, lets have this conversation there so others can learn too, plus there may be others in your area that can help you in Homer.